Taxi drivers in Madrid protest Tuesday against Uber and Cabify, which they say engage in unfair competition. MADRID -- In a sign of the tensions stirred by the introduction of ride-hailing and car-sharing services in Spain, cars were set ablaze near Seville this month. Nine drivers for the service Cabify had their vehicles torched at the start of May after pitching up in the Andalusian city to seek custom at its spring festival. Car2go, a car-sharing fleet in Madrid owned by Daimler, has suffered attacks on 70 of its cars over the last 18 months. 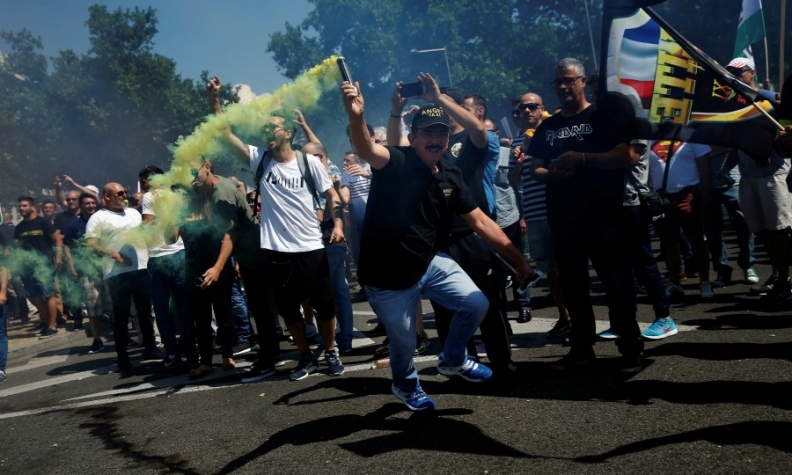 And Spanish "taxistas" went on strike Tuesday in protest at competitors whom they say mimic their service without paying for a cab license that in Madrid can cost as much as 130,000 euros ($145,496). Spain with its still-high unemployment and reliance on mass tourism is proving fertile ground for companies such as Cabify, a home-grown rival to Uber Technologies Inc. The tensions being created by the new competitors in Spain are on display in other countries from the UK to France and Italy that have also seen protests. "There's no doubt it's a source of tension," said David Murillo, a lecturer on globalization and business ethics at ESADE business school in Barcelona. "Workers are concerned about their jobs becoming obsolete, national regulators get sidetracked and there are also tax loopholes." Uber and Cabify, a service that counts Japan's Rakuten Inc. and Telefonica's pension fund among its backers, rely on clients using internet-based applications to hail a ride, budget a trip and pay. While Uber's main and most popular service, UberPop, is temporarily banned by court order in Spain, it does have licensed-chauffeur services operating in the country, similar to those offered by Cabify. "Current tensions are linked to the disproportionate increase of authorizations to chauffeur-driven vehicles," Julio Sanz, president of CTAC, one of Spain's largest taxi unions, said in an interview by phone. "They work as if they were a taxi even without a license to do so. That's illegal, and for us it's impossible to compete." Cab licenses can fetch high prices in the secondary market because some cities haven't issued new ones for years, said Sanz. For instance, the last time the city of Madrid gave out the documents was in 1978. He says there are now more than 2,200 vehicles offering Uber and Cabify service in Madrid, compared with fewer than 600 in 2012. That number compares with about 15,700 licensed cabs now plying their trade in the Madrid metropolitan region. It's not only ride-hailing services that have faced protests. Car2go, a service that allows users to pick up cars and drop them off anywhere in Madrid, have been targeted for attack. In the worst incident in December 2015, 60 cars were smashed up. "Tension is increasing in Spain because of the lack of legislative clarity when it comes to identifying services such as Uber or Cabify," said Orazio Corva, manager in Madrid for the company, in a phone interview. "It's time to change the law that regulates them." Spain's public works ministry said it would keep working to ensure an "ordered equilibrium" between the taxi industry and services such as Cabify. In a statement on Tuesday's taxi-drivers' strike, Cabify said it wasn't seeking to compete with them. "The mission of the company since its foundation in Madrid in 2011 has been to substitute individual vehicles in cities to do away with urban traffic and contamination," it said. "If this aim is achieved it would increase the demand for public services like ours and those of taxi drivers." Striking taxi drivers striking in Madrid didn't agree with that argument. "We're worried about our jobs," said Ignacio Pico, who has been working as a taxi driver in the Valencia region for the past 13 years as he took part in the protest outside the Spanish parliament in Madrid. "They're cannibalizing our industry."